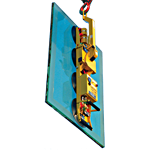 Woods Power-Grip – P1104 Glass Vacuum Lifter – Ideal for Mini Cranes. The new MRT4, with dual-circuit vacuum system technology for extra safety, is built for versatility. It delivers 360° rotation with 90° tilt from any rotation position. 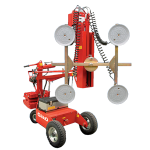 The new MRTA6 is the first lifter with ‘Quadra-Tilt’ – a unique four bar tilt mechanism that provides mechanical assistance to the operator. 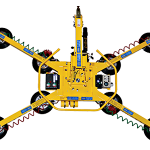 A dual-circuit vacuum system makes this the safest lifter available for mid-range handling. 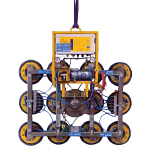 vacuum lifting – vacuum lifting equipment. 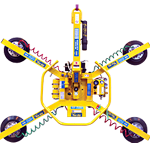 Adaptable eight pad lifter that comes with two extension arms as standard which increase capacity from 800kg to 1000kg. Huge capacity lifter with 360 deg rotation structural glazing tool. 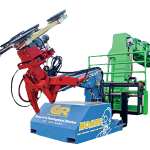 Homer links the excellent glass handling capabilities of the EMU with high access reach. 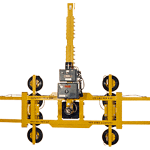 Geko + MRT4 is a mini glazing robot with 2-in-1 versatility. 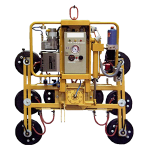 The dual circuit MRT4 vacuum lifter provide on touch suction and release when used with the Geko.